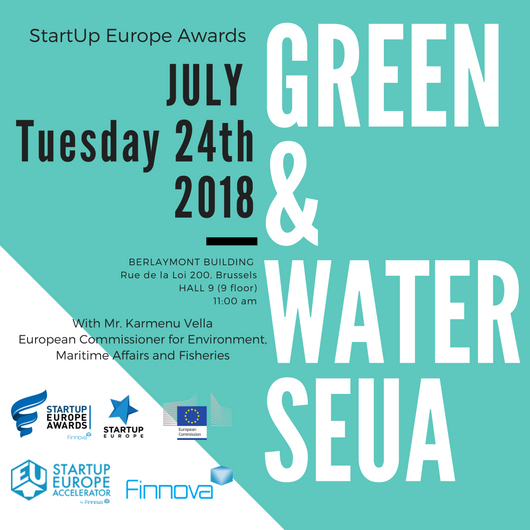 On July 24th at 11:00 a.m. the final of the of the Green and Water categories of the StartUp Europe Awards (SEUA) will be held in the Hall 9 (floor 9) of the Berlaymont Building. The event will be attended by Commissioner Karmenu Vella, who will welcome the winners of the competition. The StartUp Europe Awards (SEUA) is an initiative of the European Commission and the Finnova Foundation, supported by the President of the European Parliament, the President of the Committee of the Regions, the Vice-President of the Economic and Social Committee and several Members of the European Parliament. SEUA is supported by the StartUp Europe Accelerator of the Finnova Foundation. The finalists in the green category are: representing Belgium Robin Food is an application which aims to prevent the waste of food that is approaching its sell-by date. On behalf of Bulgaria ShiftIDEAS (BIOMYC) is developing a fully biodegradable material made of agricultural waste. Representing Croatia is Growcity which has created the ecobox, a mobile food cultivation system integrated into a transport container. From Greece, Billagi manufactures environmentally friendly women’s clothing. Representing Ireland SwiftComply‘s objective is to assist restaurants with the compliance of the regulation in its sector. On behalf of Macedonia Omega Raw and Organic Cosmetics has created a new type of organic cosmetics called “eatable” due to their organic composition. From Poland Hyper Poland has a multidisciplinary team working on the creation of new means of transport. Representing Spain Miracoil promotes scientific research in the field of hydrocarbons, renewable energies and natural resources, recycling all types of materials. Its efficient Thermomechanical Cracking Process (TMCP) makes it possible to obtain liquid hydrocarbons and create second-hand biofuels. Whereas the finalists in the water category are: in representation of Bulgaria ENOVA, whose objective is to develop innovative instruments for better and faster water quality control through its BOD monitoring system. From Italy, Mysnowmaps displays daily information of snow in the territory, helping to plan excursions in advance. From Luxembourg Weteq is a clean technology company which offers services for wastewater treatment, help to increase process efficiency, reduce costs, comply with regulations and be more environmentally friendly. Representing Poland HandyShower offers an innovative 3-in-1 personal hygiene system that can be used as a faucet, shower or bidet. From Romania, SOWAT has developed the only technology that allows to obtain potable water without the presence of genetic material of bacteria while preserving at the same time the minerals in the water. Winners will be announced through our social networks.